Inflammatory, hyperpartisan fundraising emails are a standard part of the election process, but who’s behind them can sometimes be a mystery. Take the case of a political action committee set up last fall that raised over $160,000 by sending out roughly a dozen emails. Since its inception in October, the Club for Conservatives PAC has been a confusing web of details. The group’s year-end report with the Federal Election Commission provided more information about its fundraising and spending, but also raised new questions about its operations. This is just the latest chapter in an ongoing saga which already includes “Who is Running the Mysterious PAC Supporting Roy Moore?” (Dec. 1) and “The Curious Case of the Club for Conservatives, Part Two” (Dec. 20). Club for Conservatives PAC was initially organized with the FEC by “Ms. Brooke Pendley,” but her founding of a PAC and her 1,000-word fundraising emails were striking for a young person without a discernible online profile or previous political activity. And her signature on the group’s initial fundraising emails was curious — considering her full name is Alexa Brooke Pendley, she goes by Lexie, and the accompanying headshot is of one of her sisters. A Dec. 7 FEC report was filed by Treasurer Alexa Brooke Pendley. But the year-end FEC report, filed Jan. 31, showed Nathanael Pendley as the treasurer. Nate Pendley was a top aide to former GOP Reps. Steve Stockman of Texas and Thaddeus McCotter of Michigan. He’s also been involved in some infamous campaign schemes, including attempting to recruit a homeless man in 2000 to run against the incumbent North Carolina state auditor with the same last name to spark confusion on the Democratic primary ballot. In a recent phone interview, Pendley said he is not the treasurer of Club for Conservatives PAC, and described himself as an “assistant treasurer authorized to help.” He said his daughter Brooke is the treasurer and explained that he is one of the few people to call his daughter by her middle name. Pendley subsequently relayed emailed follow-up questions to Brooke, who is a student at East Carolina University, majoring in criminal justice. Brooke explained why it was her sister’s photo in the emails. “The so-called fundraising experts absolutely insisted that they needed a headshot for the emails, and I didn’t have any such thing, so my dad sent them a posed photo of me and two of my sisters taken with a jockey at Keeneland in Lexington, Kentucky and told them to crop a head shot of me out of it. Naturally they cropped the wrong sister’s head out of it,” Brooke explained in an emailed response relayed by her father. “The mistake is understandable, as we are often asked whether we are twins, but after someone called it to my attention, I just told them to stop using any photos until I can find the stomach to go get a true headshot posed and done,” she said. Club for Conservatives sent out 10 fundraising emails from mid-November to the beginning of December featuring Brooke’s signature and her sister’s photo. According to Nate Pendley, who was involved in the Draft Sheriff Clarke for Senate PAC that targeted Wisconsin Democrat Tammy Baldwin, Brooke had the idea to start a PAC and asked her father to help. And the address of record for the PAC has changed over the course of a few months. A December call to the co-working space at the Lexington address listed on the Club for Conservatives filing revealed that the company had never heard of the PAC before. Nate told a more nuanced story in a phone interview about the company not fulfilling its obligation to collect and forward mail and eventually cutting off ties because Club for Conservatives was too political. In the two subsequent FEC filings, Club for Conservatives listed a Charlottesville, Virginia, address, which is a Mailbox Express in a strip mall where the group can receive mail. Nate explained that he went to the University of Virginia Law School and sometimes goes through Charlottesville when he drives to Washington, D.C. The latest FEC filing also showed the group made a $1,075 payment on Dec. 13 to “Old Clemmons School Properties” for “Monthly Budget Office Rental,” in the same North Carolina town where Nate Pendley lives and Brooke is registered to vote. The property, called the Historic Broyhill building, is owned by 2004 congressional candidate Ed Broyhill, a businessman whose father, Jim, served in Congress for over 20 years. Neither Pendley nor the Club for Conservatives is listed as a tenant on the building’s website, but when reached by phone, Broyhill confirmed Pendley’s payment. “I know he’s a paying tenant, and that’s about it,” said Broyhill, who recalled Pendley working with one of his 2004 opponents (former Winston-Salem city Councilman Vernon Robinson) but was not aware of his current political activity. Broyhill finished third in that 5th District Republican primary, missing the runoff by about 500 votes behind eventual winner Virginia Foxx, who has a district office in the Broyhill building. Pendley described this as the PAC’s base of operations, “where volunteers can go, I go to help and Brooke goes when she can help.” The East Carolina University campus is about three hours away in Greenville, North Carolina. Club for Conservatives formed in mid-October with promises to support former judge Roy Moore in the Alabama Senate special election. The group later attacked GOP Sen. Jeff Flake of Arizona and Democratic-Farmer-Labor Sen. Al Franken of Minnesota. Club for Conservatives disbursed a total of $16,200 in equal payments of $2,700 to Chip Roy in Texas’ 21st District, Rick Saccone in Pennsylvania’s 18th District, Rep. Trey Gowdy of South Carolina’s 4th District (before he announced his retirement), and Senate candidates Lou Barletta of Pennsylvania, Marsha Blackburn of Tennessee, and Ohio Republican Josh Mandel (who was still running at the time). All but one of the disbursements were made on Dec. 29, just two days before the reporting period ended. The Saccone disbursement was made on Dec. 31. 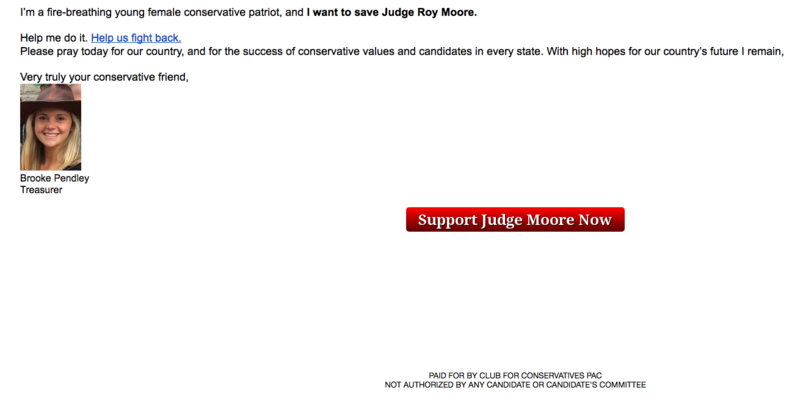 Club for Conservatives made two independent expenditures for Moore, but the timing and execution is questionable. The group publicly distributed $13,000 to Breitbart Media for digital advertising in support of Moore on Dec. 7, but the funds were disseminated on Dec. 10 (according to the FEC filing), leaving just two days to make an impact before the Dec. 12 election. Pendley cautioned that the ads may have run earlier but that the filing was made when the PAC crossed the $10,000 threshold for a specific candidate. When asked about the content and targeted audience, he demurred: “I can’t tell you exactly what it was.” He said Club for Conservatives “relied on other people” for the targeting. Club for Conservatives paid another $25,000 to Paramount Communication Inc. of Leesburg, Virginia, for digital advertising in support of Moore. According to the filing, funds were publicly disseminated on Dec. 11. Paramount is the same company listed at the bottom of some of the group’s fundraising emails. “People think email is free,” Pendley said. “But it’s not. It’s expensive.” He said Club for Conservatives built an original list of more than 3,000 donors, but may have initially rented or had access to other lists. Other expenses listed on the latest filing include $7,497.54 in credit card processing fees, $6,843.55 for “Purchase of video editing and communicat [sic],” $2,593.97 for office equipment and $297.03 for used office furniture. There didn’t appear to be a payment for mail service at the Lexington or Charlottesville locations or a rented email list. Overall, Club for Conservatives PAC raised nearly $162,000 in the last two-and-a-half months of 2017. Most of the donors are unknown, considering just $35,380 of the contributions were itemized. There were no itemized contributions listed after Dec. 12, which corresponds with the time when it appears the group paused its email campaign. “I don’t obsess over what the P.S. says,” he said. “I didn’t pay the slightest bit of attention.” Pendley said there were “professionals who take care of that,” “20-somethings,” “people in Northern Virginia,” “people in their cubicles at other locations” who take care of formatting the emails before they are sent, but declined to be more specific about the people or their relationship to the PAC. “I hope it’ll be able to sustain itself and last,” Nate Pendley said about Club for Conservatives. He hopes the PAC can identify candidates who are more concerned about a conservative mission than holding a position and identified the Nevada and Wisconsin Senate races as potential future opportunities. With varying treasurer designations on each FEC filing, multiple mailing addresses and limited availability, questions remain about Club for Conservatives and its intent. Yet it’s still unclear whether the PAC has done something illegal, and it may never be litigated unless a formal complaint is filed and accepted by the FEC. But the case demonstrates the ease with which individuals can form groups and use email solicitations to raise large amounts of money with little accountability. The PAC finished December with $89,000 in the bank.